Retro video game console emulators on phones – we all love them. And if you don’t, well, you probably should, because old-school gaming can be very entertaining and smartphones and emulators are a perfect match. Android’s openness makes it one of the best platforms for console emulation, and there are virtually flawless emulators available for the NES, the Super Nintendo, the Game Boy, Game Boy Color and Game Boy Advance, as well as for the Sega Master System, Sega Mega Drive and the Game Gear. The iconic computers Commodore 64 and Amiga have decent emulators as well, and Android even lets us enjoy PlayStation games to some extent. For info on how to get your hands on this goodness, check out TechCredo’s complete guide to emulation on Android. Even though the on-screen controls on these emulators usually work surprisingly well, nothing beats a real game pad. That’s why I like the Bluetooth Game Gripper so much. The original Game Gripper has been available for some time now, but it requires that your Android has a slide-out QWERTY keyboard. The Bluetooth Game Gripper will support most phones, however, since you connect to it wirelessly. The mechanical engineer behind these bad boys needs to know there’s an interest for his game controllers before he starts producing them. 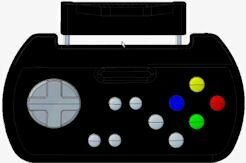 Therefore, he has turned to Kickstarter and if he receives 30 000 dollars worth of pre-orders, the Bluetooth Game Gripper will go into production. This has already been reported on many other sites (and by me on Androinica), but I wanted to keep spreading the message because I really hope the Bluetooth Game Gripper will materialize. Head to Kickstarter if you want to place a pre-order and help take retro gaming on Android to the next level. So far, he has received nearly $10.000, and there are 8 days to go. I keep my fingers crossed. You can watch the video below for more details.